AAU Gymnastics: AAU Gymnastics is a gymnastics league, separate from the USA Gymnastics league. While traditionally most gymnastics in the US has been through the USA gymnastics league, AAU gymnastics has been gaining in popularity in recent years. Learn more about AAU gymnastics here. This website focuses on the USA gymnastics league if the AAU league is not specified. AAU gymnastics typically has kinder scoring and is less intense. Acrobatic Gymnastics: Acrobatic gymnastics is a discipline of gymnastics that focuses on tumbling and using each other’s bodies to perform skills. There are five events in acrobatic gymnastics: women’s pair, men’s pair, mixed pair, women’s group (of 3 gymnasts) and men’s group (of 4 gymnasts). This sport reminds me of what you would see in a Cirque du Soleil show. Different types of athletes are needed in this discipline-smaller athletes to perform skills on top of the stronger, taller athletes which are used as bases. Acrobatic gymnastics is governed by USA gymnastics in the US and by the FIG (Federation Internationale de Gymnastique) internationally. Learn about the different gymnastics disciplines here. Acro Series: A combination of acro elements (tumbling skills) performed on floor or beam. Aerial Cartwheel: A gymnastics skill that is a cartwheel with no hands. Learn how to do an aerial cartwheel. All-Around: The term used to describe the scores of all four events (Vault, Bars, Beam and Floor) added together. In the case of the Olympics, not all gymnasts compete all events. The All-Around competition is the event in which they do compete all four events. Artistic Gymnastics: Artistic gymnastics is the most common gymnastics discipline and a very popular summer Olympic sport. It’s also the discipline that is discussed on this website. The women’s events are Vault, Uneven Bars, Balance Beam and Floor Exercise. Artistic gymnastics is governed by USA gymnastics in the US and by the FIG (Federation Internationale de Gymnastique) internationally. 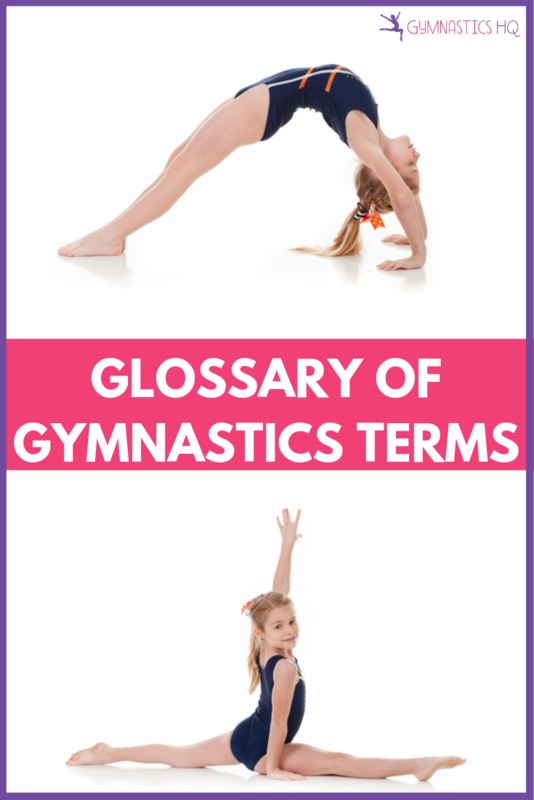 Learn the difference between the different gymnastics disciplines here. 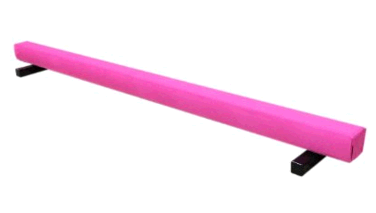 A floor balance beam, like this Pink Suede beam from The Beam Store, is a popular piece of gymnastics equipment for the home. Artistry: The term gymnastics judges use to describe the overall visual appeal of the gymnastics routine and how the gymnast performed it. Balance Beam: The Balance Beam, or simply “Beam” is one of the four gymnastics events. Regulation balance beams are 4.07 feet tall, 16 feet long and 10 centimeters (or approximately 4 inches) wide. A low beam or floor beam is a popular piece of home gymnastics equipment. Back handspring: A basic floor skill, and also one of the most coveted, elusive skills for beginner gymnasts. Here are tips on how to learn a back handspring. Bonus: In levels 9 and 10 gymnastics routines do not automatically have a 10.0 start value. Gymnasts can perform connections that earn them the extra tenths to start closer to a 10.0. These connections are called “bonus.” You can learn more about gymnastics scoring with this 10 minute guide. Bridge: A bridge is one of the most basic skills or shapes in gymnastics. To do a bridge, the gymnast lies flat on the floor, and then pushes up so that she is supported by her hands and feet. It’s easier to understand by looking at the picture. Cartwheel: One of the most basic floor skills. Learn how to do a cartwheel. Cast: A cast is a basic skill, movement on bars. It’s when the gymnast moves her hips away from and then back to the bars. In more advanced gymnastics levels, being able to do a cast to a certain angle becomes a requirement. Capitol Cup Format: Capitol Cup format is a gymnastics meet format where gymnasts warm-up an event and then compete that same event immediately following. Capitol Cup format requires a venue with two gyms — a warm-up gym and a competition gym. Instead of 4 groups of gymnast each assigned to a starting event like in traditional format, there are 2 groups of gymnasts assigned to each event: Flight A and Flight B. This way one set of gymnasts (Flight A) can be warming up in the warm-up gym while the other gymnasts (Flight B) are competing that event in the competition gym. More gymnasts can compete in a session with this format and the judges’ time is maximized. Also, it’s a benefit to the gymnast to have a complete warm-up and then compete that same event. Gymnasts are allowed a “touch” — a short warm-up time on the actual competition equipment before competing. Cat Leap: A cat leap is a leap where your legs are in the “cat” position. Your knees are bent and your thighs come up to horizontal with a 90 degree hip angle. A cat leap is an “A” skill on both Floor and Beam. A cat leap full turn is a “B” on Floor, and a cat leap half is a “B” on Beam. Chalk: Chalk is used on grips or bare hands on bars to keep the gymnast’s hands from slipping off the bars. Choreography: Term for how the routine is composed; the dance elements, steps and movements that make up the routine. Circling Element: Gymnastics judges term for any bar skill that goes around the bar, like a free hip. Club Gymnastics: The term “Club Gymnastics” typically refers to gymnastics competed in college as a member of the National Association of Intercollegiate Gymnastics Clubs or NAIGC. Some colleges have a gymnastics team that competes along side other competitive sports teams in that college’s athletic conference along with a club team. The club team is typically less advanced gymnastics. They compete modified level 9 rules. Composition Errors: The term used when the gymnast receives deductions related to how the routine was put together, or “composed.” It’s something that is considered in the gymnastics scoring process. Compulsory Gymnastics: Compulsory gymnastics are the levels where gymnasts perform specific routines that the gymnasts must learn exactly. These are gymnastics levels 1-6. USA gymnastics created the routines with the goal that the gymnasts have a strong gymnastics foundation before advancing to the optional levels. Learn the difference between compulsory and optional gymnastics here. Connection Value: In some levels of competition, including Optional Levels and FIG, gymnasts receive additional points for connecting two elements together. Dance Passage or Dance Series: A dance passage or dance series is a combination of two or more dance elements performed on the Floor Exercise or the Balance Beam. This could be a leap with a jump, a leap with a leap, or a jump with a jump. For example — a switch leap connected to a straddle jump, a switch leap connected to a cat leap, or a straddle jump connected to a tuck jump. Dance-Through: Doing a “dance-through” means to perform your beam or floor routine with just the dance elements, without the tumbling skills. Deductions: The term used in gymnastics to take away from a gymnast’s score for errors. Difficulty Score or The D-Score: In international competition based on the FIG Code of Points, there are two components of a gymnasts final score. Two panels of judges score each routine and the final score is the combined total of these two scores. The two components are the Difficulty Score or the D-Score and the Execution Score or the E-score. The D-Score evaluates the routine based on the skills performed and their difficulty level. This includes the Difficulty Value (DV), the Composition Requirements (CR) and the Connection Value (CV). The D-Score is open-ended. Dismount: Dismounts are the skill used to get off an apparatus. Gymnasts dismount from the Balance Beam and the Uneven Bars. Dynamics: The term gymnastics judges use to describe the overall power and amplitude of the gymnastics routine. It’s something that is considered when judges come up with the gymnastics score. Element: An element is any single move in a routine that has a value. Also called a gymnastics skill. Elite: The gymnastics “pro” level that a gymnast advances to either after level 10 or from the TOPS program. Execution Score or E-Score: In International competition based on the FIG Code of Points, there are two components of a gymnasts final score. Two panels of judges score each routine and the final score is the combined total of these two scores. The two components are the Difficulty Score or the D-Score and the Execution Score or the E-score. The E-Score evaluates the execution and artistry of the routine. The E-Score comes from a a 10.0. Judges take away from a 10.0 based on execution errors. Federation Internationale de Gymnastique or FIG: The Federation Internationale de Gymnastique is commonly abbreviated FIG. FIG is the international sports governing body for gymnastics. FIG publishes the FIG Code of Points, which is the rule book used for scoring international competitions, including the Olympics. USA Gymnastics publishes a code of points which we use in the U.S. as our rule book for Optional Levels of gymnastics. Flic Flac: A flic flac is another term for a back handspring. Floor Exercise: Floor Exercise, or simply “Floor,” is one of the four gymnastics events. It is sometimes abbreviated “FX.” Most competitive floors are spring floors made of foam and plywood to make the floor bouncy. Competitive floors measure 39 feet by 39 feet. Here is more information on the Floor Exercise. Flyaway: A dismount off bars where the gymnast swings and flips off. As a gymnast advances she learns more difficult flyaways with twists or multiple flips. Grips: Grips are leather strips worn on your hands during bar workouts to protect your hands from rips. A grip is basically a piece of leather material that covers the palm of the hand and is attached at the wrist with velcro and secured on the fingers with holes. Here is more information on the importance of grips and a guide to buying grips online. You can take this quiz to find the best grips for you. Gymnastics Meets: Meets are gymnastics competitions. Different teams get together and compete — they are to gymnastics what games are to football or soccer. Here is a parent’s guide to gymnastics meets. Handstand: One of the basic skills in gymnastics, and some version of it shows up on each of the four events. Learn how to do a handstand. Illegal Skills: Skills that you are not allowed to perform at that gymnastics level. A judge makes sure a gymnast hasn’t done any in her routine during the gymnastics scoring process. Inquiry: A procedure initiated by the gymnast’s coach to contest the gymnast’s score in some way. The judges review the inquiry and determine if a mistake was made. Junior: An elite-level gymnast that competes at the international level but does not meet the age requirements for the Olympics. Junior Olympic or JO Program: The USA Gymnastics Junior Olympic Program, or as it is often abbreviated, JO Program is the set of gymnastics rules and levels listed here. Kip: A bar mount that is oftentimes a struggle to learn because it requires lots of upper body strength. Here’s how to do a kip with drills and exercises to help you learn. Layout: Gymnastics salto, or flip, in the completely stretched position. Leotard: Leotards are the standard outfit worn by gymnasts, most gymnasts in the gym wear them. Learn where to buy leotards online. Mental Block: A situation where a gymnast is struggling to get over her fear in order to do a skill. Here is a mental workout to help with mental blocks and fear. Mobility Meet: A mobility meet is a meet with the express purpose of getting the gymnasts to mobilize to the next level by earning the mobility scores they need. Mobility Score: Mobility score is the all-around score needed to advance to the next gymnastics level. Modified Capitol Cup: Modified Capitol Cup format is a gymnastics meet format where there are two sets of equipment in the competition gym. It’s Capital Cup format without the warm-up gym. So Flight A will warm-up on one set of equipment and then compete on another set immediately following. While they compete, Flight B is warming up that same event. Modified Capital Cup is good for the gymnast because there is less time between warming up and competing, and it’s good for the gym because more gymnasts can compete per session. Mom & Tots Class (or Parents & Tots Class): Mom & Tots or Parents & Tots classes are many times the first gymnastics class offering for your child. These classes are for young kids before preschool. Mount: A mount is the skill used to get on the apparatus. Mounts are needed for Balance Beam and Uneven Bars. Neutral Deductions: The term gymnastics judges use to describe deductions or errors that have nothing to do with how the gymnast performed the routine. They are a penalty for a violation of a rule that is separate from how a routine is performed, like for not having correct competition attire. Optional Gymnastics: Optional gymnastics is when everyone does different routines. This is done in gymnastics levels 7-10. Learn more about the difference between compulsory and optional gymnastics here. Panel Mat: One of the most popular pieces of home gymnastics equipment. Named because of the “panels” that make the mat easily fold-able. Pike: Pike is one of the basic gymnastics positions. In a pike position your legs are brought up to hip level while straight with your knees touching each other and your toes pointed. Pike jumps are done on floor and beam. Flips are done in a pike position and are called either a “front pike,” a front flip in a pike position, or a “back pike,” a back flip in a pike position. Popa: Straddle jump with a 1/1 turn. 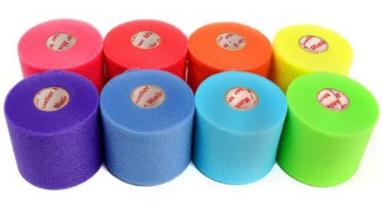 Pre-Wrap: The gauzy material that goes under athletic tape to prevent you from the pain of having to rip out all of your arm hair when removing the tape. Press Handstand: A press handstand is a skill where the gymnast starts from a seated position, and by moving her weight forwards on her hands, she pushes into a handstand. Learn how to do a press handstand. Relevé– The position when you are standing on your toes with your feet extended. 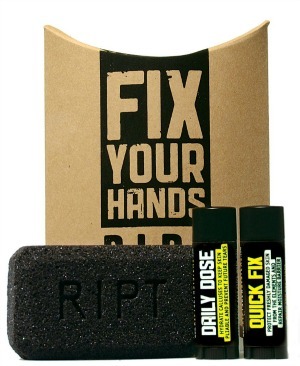 Ript Skin Systems can help heal your hands after a rip and help you prevent them in the first place. Rhythmic Gymnastics: Rhythmic gymnastics is a discipline of gymnastics that combines tumbling and dance. There are six events — rope, club, hoop, ball, ribbon and free. Gymnasts combine ballet and dance moves in routines choreographed to music while manipulating the apparatus. Both individuals and partners compete. 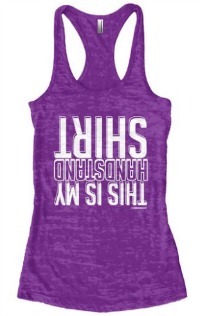 This can be a great choice for a child that likes both dance and tumbling. But, it can be hard to find a gym that teaches rhythmic gymnastics. Rhythmic gymnastics is governed by USA gymnastics in the US and by the FIG (Federation Internationale de Gymnastique) internationally. Rips: Rips are friction injuries from the bars where the outer layers of skin rip or tear away from the hand. Grips can be used to help prevent rips. Learn the best strategies to prevent rips and what to do once you have one in my Guide to Gymnastics Rips: Prevention & Care. Salto: A salto is the official name for any type of “flip” in the air. Salute: In gymnastics the term “saluting” or “presenting” to the judge is when the gymnast raises both hands in the air and looks at the judge in acknowledgement. This is done after the judge has “saluted” the gymnast by raising one arm. This shows the gymnast that the judge is ready. Scale: In gymnastics, the term scale refers to a move where you stand on one leg and hold the other off the ground. Senior: An elite-level gymnast that meets the age requirement for the Olympics. Skill: A gymnastics skill is a single move. The recognized gymnastics skills are listed in the JO Code of Points. Special Requirements: USA Gymnastics‘s term for optional routine requirements that have a value of .5. In my GymnasticsHQ Skill Progression sheets I show skills which could fulfill these requirements. Split: A split on the ground is a skill gymnasts use to improve their flexibility. The split position is one of the basic shapes in gymnastics. Some of the skills that use the split position are split leaps, and split jumps. Start Value: The value of the routine before execution deductions are taken. The judge looks at whether the gymnast has all the requirements for her gymnastics level. split. Straddle jumps are done on beam and floor. Side leaps are leaps done in the side straddle position. Timer: A term used to describe when a gymnast practices the first part of a skill. For example, a Tsuk timer, is when the gymnast does the first part of the vault without flipping. TOPS: The acronym TOPS stands for the Talent Opportunity Program. TOPS is a program created by USA Gymnastics in order to find young talent, with the goal of having a strong national team. Trampoline and Tumbling Gymnastics: Trampoline and Tumbling gymnastics is a gymnastics discipline that has been recognized since 1967 but debuted at the 2000 Olympic Games. The trampoline and tumbling events are individual and synchronized trampoline, double mini trampoline and power tumbling. This might be the right discipline for your child if they really enjoy tumbling, since it’s basically tumbling skills on both the floor and on the trampoline. Trampoline and Tumbling gymnastics is governed by USA gymnastics in the US and by the FIG (Federation Internationale de Gymnastique) internationally. your chest. Your knees should be touching your chest and each other with your toes pointed. Your knees should be brought to horizontal in order to not receive a deduction. Tuck jumps are done on the Floor Exercise and Balance Beam. Flips done in the tuck position are called either a “front tuck,” a front flip in a tuck position or a “back tuck,” a back flip in a tuck position. Uneven Bars: Uneven Bars or simply “bars” is one of the four gymnastics events. The bars are different heights, or “uneven,” to allow the gymnast to jump between them. The upper bar is 8.2 feet tall and the lower bar is 5.6 feet tall. The diameter of the bar is 4 centimeters and they are 7.9 feet long. They are made of fiberglass with wood coating. The uneven bars are sometimes abbreviated UB. Here is more information about the Uneven Bars. USA Gymnastics: USA gymnastics is the official governing body for gymnastics in the US. In general (and on this website), when discussing competitive gymnastics rules and regulations we are talking about USA gymnastics rules. In the history of gymnastics, the United States Gymnastics Federation, now known as USA Gymnastics, was formed in 1970. Vault: Vault (the event) is performed on a vault table (the piece of equipment), but the term can be used for both the event and the piece of equipment. The vault table is 3.9 feet long by 3.12 feet wide. Gymnasts are allowed to adjust the height of the vault. Vault is one of the four gymnastics events. The vault is sometimes abbreviated VT. Here is more information about Vault. Value Part: Value Parts are elements that make up a gymnastics routine; these elements are assigned a value. The easiest elements are assigned an A, the next hardest a B and so on.How many of each the gymnast needs in her routine depends on the gymnastics level. Wolf Jump: A wolf jump is a jump on floor and beam that is similar to a pike jump, but one leg is bent. So when you jump, one leg is extended, and one leg is bent with the knees touching. Xcel Program: The Xcel Program is a different competitive program from the JO Program. It is often used in combination with the traditional JO Gymnastics Levels to let gymnasts compete optional gymnastics in addition to compulsory gymnastics at the early levels. The Xcel Program is a set of optional rules that can be used while the gymnast is learning levels 4-6 compulsory skills.